The UAKN Atlantic operates out of the Faculty of Education at UNB Fredericton, New Brunswick. Dr. Verlé Harrop is the Director of the UAKN Atlantic and reports to an Executive Committee representative of the four Atlantic Provinces. Member composition of the Executive Committee follows SSHRC guidelines and includes urban Aboriginal community members and groups, elders, emerging Aboriginal scholars, academics, practitioners and government representatives. Working by consensus, the 13-member committee sets UAKN Atlantic’s research priorities and ensures that the community-driven research they support meets the needs and aspirations of urban Aboriginal peoples living across Atlantic Canada. To date, the UAKN Atlantic has funded 28 research projects. 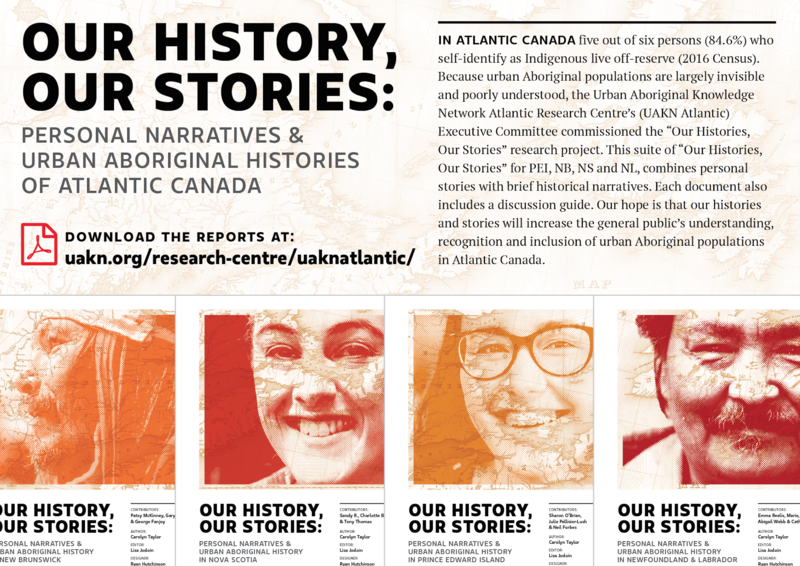 The UAKN Atlantic is now entering its knowledge mobilization phase and would like to share its research findings from its 28 research projects with Atlantic Canada’s broader Indigenous community, academic institutions and governments. In addition to increasing the visibility of urban Indigenous populations in Atlantic Canada, this conference is designed to familiarize participants with community-driven research methodologies – namely, what community-driven processes work and what institutional or colonial barriers are frequently encountered. Following presentations by community members grouped around: urban Indigenous children, their families and community; well-being; education; urban Indigenous identity and duty to consult — a guest panel comprised of community leaders, academics and government representatives, will dialogue with presenters on: 1. How the research findings can inform policy and practice in ways that support self-government and self-determination,and 2. What true reconciliation would look like. Kelly Benning, Grand Prairie Regional College Friendship Centre, Alberta. There will be on-site exhibitions of: Halifax Mi’kmaw Native Friendship Centre’s “This is what I wish you knew” art panels and videos; Films “Tracing Blood” and “Feast of Forgiveness”; digital stories from Newfoundland and Labrador’s “Re-Storying NunataKavut” and “Women’s Narratives”research projects; and featured videos from Atlantic Canada’s contribution to the National Centre for Collaboration in Indigenous Education’s (NCCIE) virtual library. This conference will be of interest to community members, educators, researchers and all levels of government. ContinuingEducation Credits will be arranged with the NB Medical and Law Societies, NBASW, MMBSW, nursing and education associations. UAKN Atlantic PHAC Sharing Lessons Learned Report 2017 Now Available! UAKN Atlantic is hosting Two Webinars on February 6 and February 13, 2017 – Register Today! Urban Aboriginal Student Experience in Post-Secondary Education: Are Institutions and Support Systems Successful in Meeting their Needs?